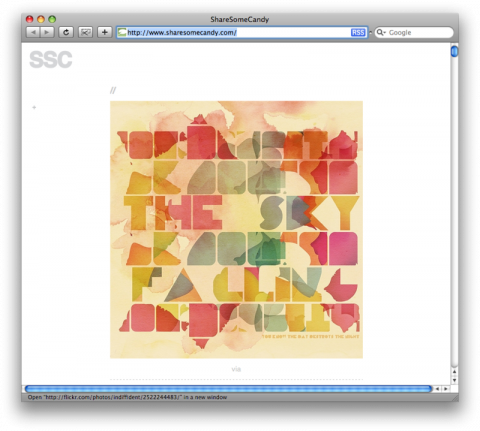 Sharesomecandy.com is a curated site of design and art inspiration that can have unlimited contributors. Each post has nothing other than the image and a “via” text link to the site where the image was found. There are no titles (just two forward slashes “//” to allow for a permalink in case someone wants to link back), no categories, keywords or comments. Just pure eye candy. Contributors can post from either their own blog or from someone else’s. Guest entries are initially curated, and eventually contributors become guest authors. The end result is an ever-changing resource of visually fresh and inspiring material. Some might compare the concept to ffffound. The contributors themselves will be anonymous. So, you can totally post things from your own blog, without looking like you’re promoting it directly. Oh wow, one of my pieces is on there. Thanks. Now how does one become a contributor? yes, how can someone become a contributor?